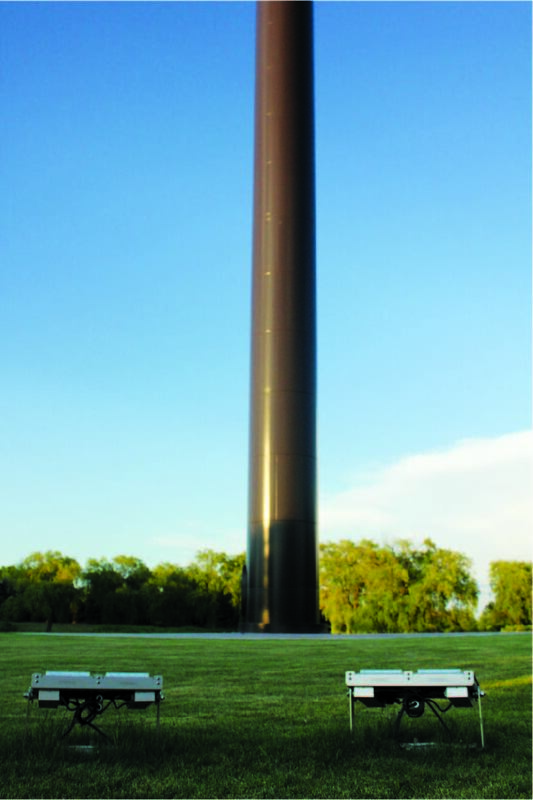 Outside the Acuity Insurance building in Sheboygan, WI, stands a 400-ft.-tall flagpole, said to be the tallest in North America and 100 ft. taller than the Statue of Liberty. Erected as a symbol of gratitude for the service and sacrifice of those who defend our country, the mega-flagpole towers above the rural Wisconsin city. At the top of the pole is a massive 7,200-sq.-ft. United States flag. Each star is 3 ft. wide; each stripe is 4 ½ ft. tall. At the base of the pole is a memorial made of bricks inscribed with the name of every fallen soldier from Sheboygan County dating from the Civil War. Since the memorial’s dedication, hundreds of people have traveled to see this architectural feat and pay their respects to the hundreds of heroes in honors. 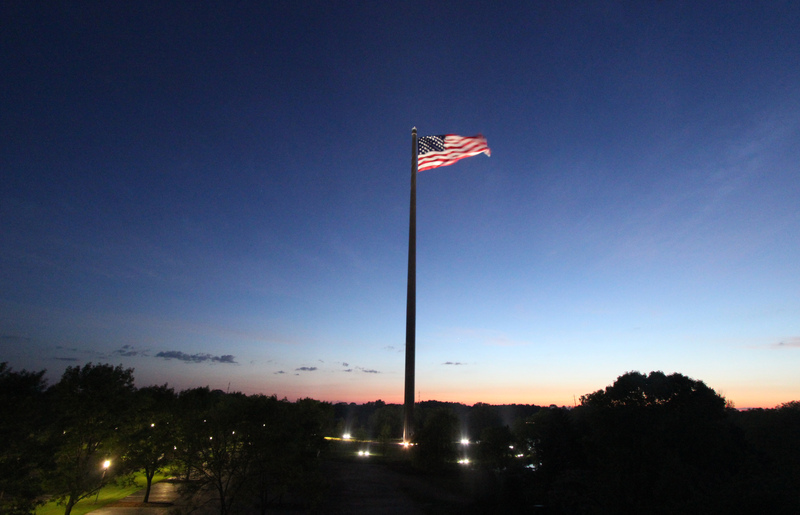 Not only does the flagpole exude brilliance during the day, it needed to be equally striking at night. Administrators at Acuity turned to lighting consultant Marty Peck and his team from Creative Lighting Design and Engineering, Milwaukee. The lighting design process posed a number of challenges. The conventional method of aiming fixtures at the top of a flagpole would not be sufficient. Too much light would be concentrated on the pole and leave a large portion of the flag dark when fully extended. Another concern was an 11-ft. section at the top of the pole that contains mechanical elements. The mechanics include a revolving truck that rotates with the wind to prevent the flag from wrapping around the pole, along with an automated winch to lower the flag. Although necessary for the structure, they were not aesthetically pleasing. Peck decided to aim the lighting fixtures strategically to the side of the pole, highlighting the flag and not the pole. Due to the rural setting, the team had to calculate how much light to use. Acuity officials wanted a good balance in light levels to illuminate the flag, so a goal of .075 to 1 average footcandles was chosen. It was also decided to dim the fixtures to 50% every night after midnight. Color temperature was carefully examined. The team constructed a mockup to determine the best rendering to accentuate the blue and red of the flag. A cool-white color temperature of 5,000 K was chosen. Although the flag is 120 ft. x 60 ft, the area to illuminate was a 246-ft.-dia, 60-ft.-tall cylinder, when accounting for all directions that the flag could be flying. 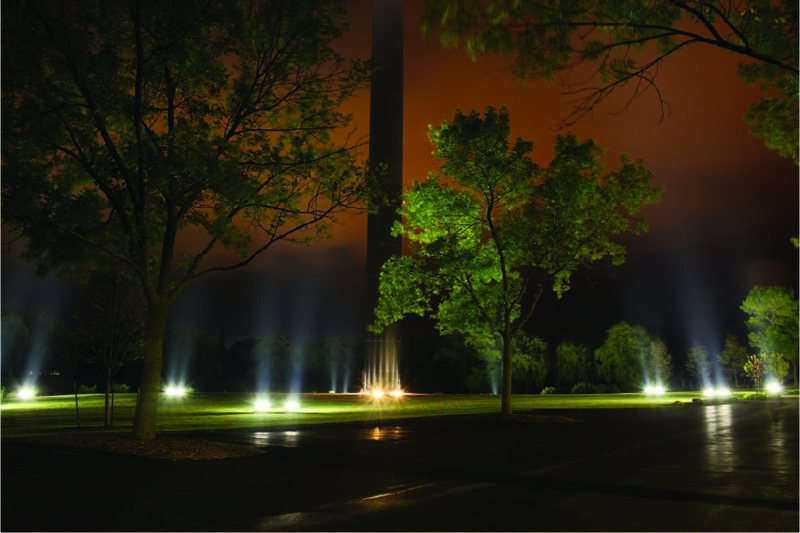 Strong but concentrated beams of light would be required to optimize the flags nighttime appearance. After the beam pattern was established, Peck sought a lighting fixture to fulfill the reequipments and chose Phoenix Products Co. Inc., Milwaukee. After experimenting with several lighting options, the EcoMod 300, with its narrowest beam patters, was chosen. With precise directional capabilities, exceptional light quality, and durable design, the fixtures proved perfect for the application. The lighting team decided on 18 fixtures grouped into nine pairs to optimize the light output while keeping the surrounding area as unaffected as possible. In a radius of 55 ft. from the pole, they aimed the fixtures 22 ½ deg. to either side of the pole and about 6 deg. down from vertical. This lit the entire flag regardless of wind strength and direction. This strategy also increased the flag’s vertical luminance and rippled texture in the wind. The light angle also needed to properly light the flag when if was flying at half-mast. With its precise aiming and defined optics, the EcoMod provided the correct illumination. The decision to veer from the traditional flagpole lighting technique has been reaffirmed in the months following installation. The flag’s height, along with the wind from nearby Lake Michigan, causes it to rarely hang down. Ben Salzmann, president and CEO of Acuity Insurance said, “We proudly fly this flag because we are blessed to live and work in the United Sates of America.” And because of the intricate lighting design, his vision of patriotism is equally radiant at night.